Millions of people use self storage units to great effect. As convenient ways to safely store seasonal equipment, decorations, clothing, old furniture, antiques, even inventory and other business related items, self storage units can be extremely convenient and cost effective. That being said, there are some things that are simply not fit to be stored. If you are wondering what you cannot safely store in a self storage unit, below are five items. It should go without saying that keeping live animals in a storage unit is illegal and unethical, but did you know that in most instances it is prohibited by the owners of the facility to store animals that have been killed while hunting and that have not been taxidermied yet. Even if you keep the animal butchered and in a freezer, it has the potential to attract pests and pose problems for you and surrounding units. This is related to the above category. It is not wise to keep food of any kind in a self storage unit, or anything else that insects may be attracted to (scented candles, boxes that have had food in them, water jugs, things that could be easily used for nesting material) because doing so always carries with it the risk of attracting unwanted pests such as insects and rodents. If these pests end up wreaking havoc on your belongings, that is obviously your fault and responsibility, but if they end up doing damage to other people’s property, you might be on the line for the damages. Storage facilities are not going to provide you with insurance and they typically are not going to allow you to store an uninsured, unregistered vehicle on their premises. They typically reserve the right to check and see whether you have the required paperwork . It should go without saying that anything that could potentially explode or catch fire is not something that is wise to keep in the confined spaces of a self storage unit. This includes propane tanks, any aerosol containers, oil, paint, gasoline, kerosene, etc. 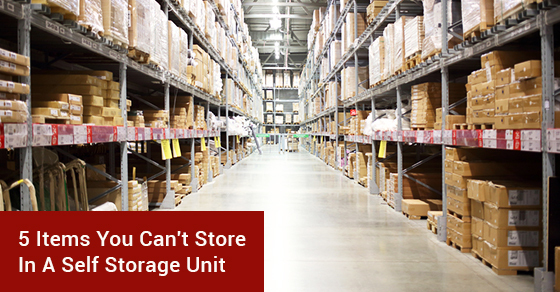 The exception to this is when you rent a self storage space that is climate controlled. Other than that, it is generally not advisable to keep sensitive electronic equipment in an environment where extreme temperatures are likely to do damage. Self storage units don’t come with too many rules and you can generally use them, within reason, how you see fit. They are great at taking things off people’s hands, helping during moves, even with running businesses that are short on space. Just keep the above five categories of items in mind to ensure that you are not storing anything that is unsafe or prohibited. Why Should You Invest in a Self-Storage Unit for Your Business?